Whether it is quality control in a manufacturing setting, driving a construction project to completion under budget and on time, or safely analyzing stockpile volume in a mining operation, accurate and timely measurement is key for many companies. Recently, 3D scanning technology has emerged as a compelling solution for a bevy of metrology applications, and has even enabled some new ones altogether. 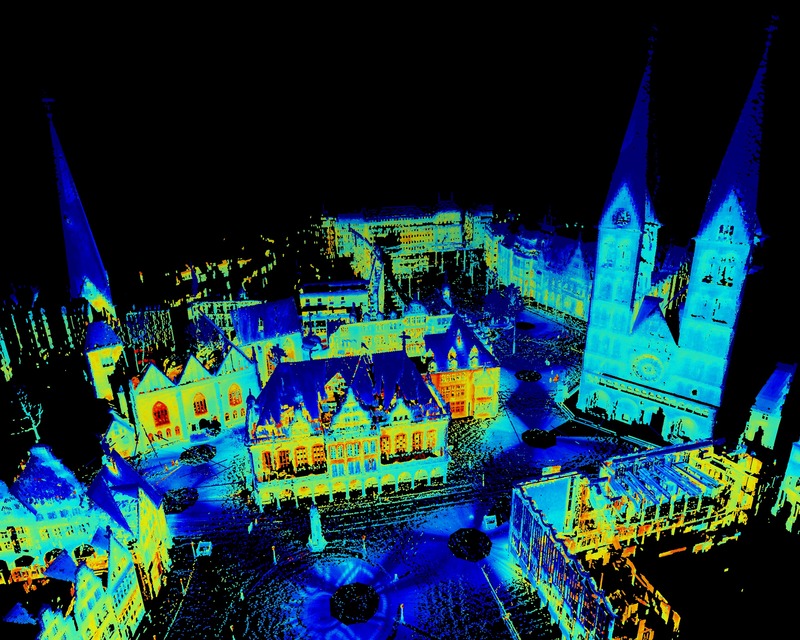 3D scanning systems use laser or structured light technologies to generate a point cloud rendering of objects. Users across industries are finding 3D scanning solutions often have advantages over existing methods. In the manufacturing world, quality control experts have traditionally relied on coordinate measurement machine (CMM) touch probe devices. Though offering potentially unmatched accuracy, CMMs are necessarily limited in the number of points they can measure. For certain curved surfaces this leads to inadequate coverage. Light, on the other hand, can reach all those surface twists and turns to capture an accurate rendering. Furthermore, scanning tends to be faster than tactile processes for many geometries, is easier to automate than a CMM via industrial robotics, and buying a scanner is far cheaper than a CMM. 3D scanning has also found a home in asset management. One part of the mining workflow requires assessment of stockpile volume. Formerly, this involved workers navigating live work sites to climb onto stockpiles and manually map data points via GPS devices. This approach is slow, inaccurate, and most importantly, dangerous for technicians. Miners are finding success turning to 3D scanning solutions, either terrestrial or drone-mounted, to address these issues. Building information modelling (BIM) is a process commonly utilized in architecture, engineering, and construction (AEC) activities. Surveyors take measurements of structures or pre-construction conditions in order to check the design model against physical reality. This as-built verification allows for early detection of discrepancies in the construction process. Having an updated model enables construction workers to do their jobs more efficiently too, especially when integrated with AR equipment. When the project is done, a verifiably accurate digital model of the structure can be handed to the operator or maintenance personnel. AEC professionals have relied on legacy surveying equipment for the measurement component of BIM, but are quickly making the switch to 3D scanning systems for improved speed and accuracy of measurement. In addition to becoming the tool of choice for many existing reality capture applications, 3D scanning is enabling entirely new types of customers to integrate reality capture into their businesses, particularly as suppliers have begun marketing affordable, simple scanner models in addition to their higher end offerings. This “democratization of scanning” means that real estate professionals are now using 3D scanning to give virtual property showings, interior designers are scanning worksites to gain canvas models, and tourists can now experience attractions remotely in the virtual world, such as this rendering of Frank Lloyd Wright’s iconic winter home, Taliesin West. Scanning is also being used for object modeling in multimedia/entertainment as well as for crime scene capture by law enforcement investigators. As scanning hardware approaches technological maturity, companies have been focusing on greater automation, easier to use products, streamlined software, and automatic object/part recognition capabilities to differentiate themselves. Expect both the scanning and post-scan value-extraction processes to become more and more effortless over time. 3D scanning has become a formidable contender for many metrology needs, and its adoption by customers is only likely to continue growing. To learn more about the 3D scanning market through ARC’s research, please visit our most recent study page.